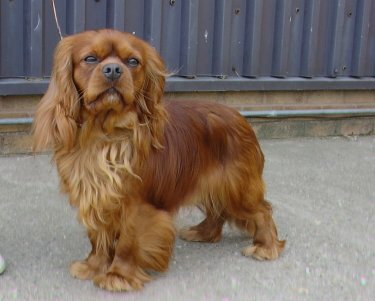 Alfie is from Saffie's first litter (2004) and was the first Ruby in our house for 15 years. 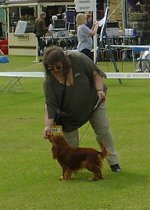 Alfie retired to compete in Veteran classes and was Best Veteran at ECCKCSS Open show in October 2012 under judge Mrs June Hazeltine. 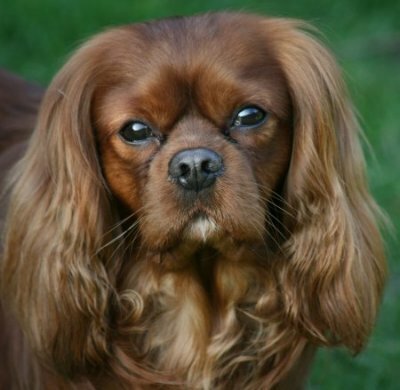 He was also placed 2nd in the Veteran class at Crufts 2013 by judge Mrs Anne Rennard. 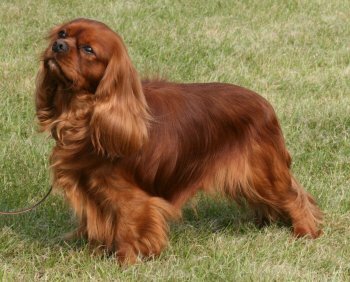 Alfie won the Graduate class at Darlington 2006 and also won the same class at the Scottish CKCS Club Championship show in October 2006. 2006 and Third in Post Graduate at Eastern Counties CKCS Society Championship Show qualified him again for 2007, at Windsor Championship Show, judge Miss M Morrison had this to say when awarding him 1st in Special Yearling class.."Another smart and showy ruby boy, similar in size to my junior winner. A richly soft textured coated ruby, with lovely sheen to coat which was of good length, well feathered overall. Appealing masculine head and expression, bright dark eyes. Well arched neck, correct lay to shoulders, kept a firm level topline. 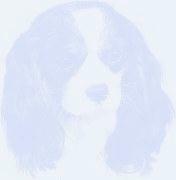 Compact well angulated body, plenty of depth to chest, firm muscled hindquarters, tail used well. Handled to display a smooth easy movement, when standing looked lovely, though handler at times over stretched him in the rear. Like the junior winner looked at him as a contender for the RCC." 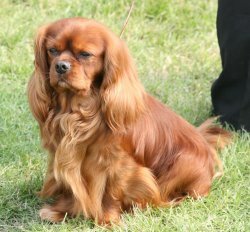 'Alfie' won Best Of Breed from an entry of 88 Cavaliers at Sheffield & District KA Open Show on 5th March 2006 under judge Mrs Mary Grace Eubank (Pinecrest - USA). Amazingly as Steve was showing him! 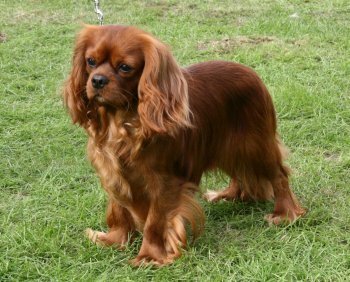 2005 and 'Alfie' qualified for Crufts with a 2nd in class at Southern CKCS Club, Championship Show in April under judge Mrs Gladys Baillee. 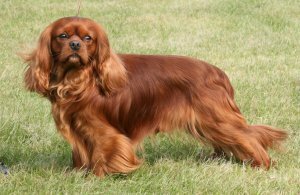 At Bath Championship Show he won the Puppy class to qualify for Pup of the Year. He had 2 other places at Champ Shows later in the year.